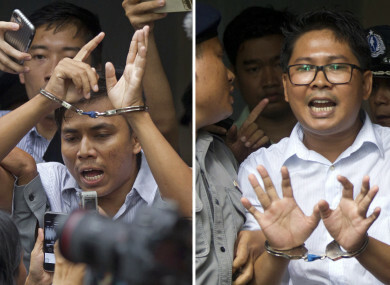 Reuters journalists Kyaw Soe Oo, left, and Wa Lone, are handcuffed as they are escorted by police out of the court today. TWO REUTERS JOURNALISTS accused of breaching Myanmar’s state secrets law while reporting on a massacre of Rohingya Muslims were jailed for seven years today, fuelling further international outrage a week after the army was accused of genocide. Wa Lone, 32, and Kyaw Soe Oo, 28, who have been held in Yangon’s Insein prison since their arrest in December, were charged with violating the Official Secrets Act, a British colonial-era law which carries a maximum sentence of 14 years. They are sentenced to seven years in prison each. Kyaw Soe Oo’s wife wept after the judge delivered the verdict. “Today is a sad day for Myanmar… and the press everywhere,” Stephen J Adler, Reuters editor-in-chief, said in a statement, adding that the outcome was “designed to silence their reporting and intimidate the press”. The UN in Myanmar and the European Union joined the growing chorus of calls for the reporters’ release. Rights groups decried the verdict as a sign of enduring repression in a country meant to be edging towards a more open and democratic future after almost a half-century of army rule. The ruling “sends a stark warning to other journalists in the country of the severe consequences that await should they look too closely at military abuses”, Tirana Hassan, Amnesty International’s director of crisis response, said in a statement. This amounts to censorship through fear. Today’s ruling comes a week after the release of an explosive United Nations-led study into abuses in Rakhine, accusing Myanmar’s army chief of heading a campaign of “genocide” and “crimes against humanity” against the Rohingya. Email “Outrage as two Reuters journalists jailed over breach of state secrets law”. Feedback on “Outrage as two Reuters journalists jailed over breach of state secrets law”.